The Women’s History Matters Logo is available for download. Feel free to use it when celebrating your own Women’s History event! We only ask that you include information about the Women’s History Matters website in your publicity. When using the logo, please include the tagline “Find more at MontanaWomensHistory.org.” You can download the logo here. What can you do to celebrate Montana women’s history? Identify active women in your community, past and present and find a way to honor them at a city council or other public meeting. A group of suffragists march in Washington, D.C on February 14, 1917. Hazel Hunkins, of Billings, leads the way. Photo Credit: National Woman’s Party Records, Group I, Container I:160, Folder: Pickets, 1917. Accessed via American Memory, Library of Congress. Register to vote and encourage others to vote. Protect the hard-fought victory. Find out if local high schools have information about voter registration for 18 year olds or help them celebrate their new voting status. For information about voter registration and elections in Montana see the Secretary of State’s Election and Voting page. Host a Montana women’s history program or speaker. Hear Jeanette Rankin talk about her role as America’s Conscience. Listen to Nancy Cooper Russell describe her Montana experiences and role as promoter for her husband, artist Charlie Russell. Engage with WCTU and suffrage activist Mary Alderson Long of Bozeman. Watch as Missoula pioneer Sarah Elizabeth Woody showcases her trunk of Montana memorabilia and recounts her life story. Engage historians as they present on the history of women’s political activism, author and rancher Caroline Lockhart, Victorian fashion, and vacationing in Yellowstone. Learn about the new Montana Women’s Mural in the state capitol. See a list of speakers available through Humanities Montana or schedule a speaker from the Montana Historical Society. Read more about Montana women. Download an article published in Montana The Magazine of Western History or choose one of the many books (fiction and non-fiction) depicting Montana women’s lives. Create or preserve local cookbooks. Montana women from Cowbelles to church-goers compiled recipes as fundraisers for their community building efforts. The Montana Historical Society has over one hundred cookbooks dating from 1881 through 2006. Peruse the Red Cross (c. 1917) cookbook for a ‘new’ recipe! Choose books by or about Montana women for your book club selection. Visit historic sites in your community related to women’s history. Visit the Places page to plan your next adventure or create and share a women’s history walking tour of your own community. Visit the women’s history mural in the Montana capitol building. Support women artists and entrepreneurs. Invite Tami Haaland, Montana’s poet laureate, to come speak to your community. Host an art show or a poetry reading. Buy local crafts and support a long tradition of Montana artists such as quilt makers and beaders. Follow in the footsteps of pioneer women photographers such as Evelyn Cameron and Julia Tuell. Document the history happening all around you. An advertisement from the October 22, 1896 edition of the Anaconda Standard featured a female bicyclist! Keep a diary. Historians rely on diaries to understand social history, including the lives of every day women. You can read diaries written by earlier Montana women by visiting your local historical society, the Montana Historical Society, or by looking online. Donate a women’s history collection to either the Montana Historical Society or your local museum and library. If you belong to a women’s organization, find out where the records are and make sure they are preserved. Find out what role women played in your community, school, church, business, club or agency and prepare a display or record their history through an oral history interview. Attend a high school or college sporting event for girls to celebrate women’s sports equity through Title IX. Teach young Montanans about our influential women. 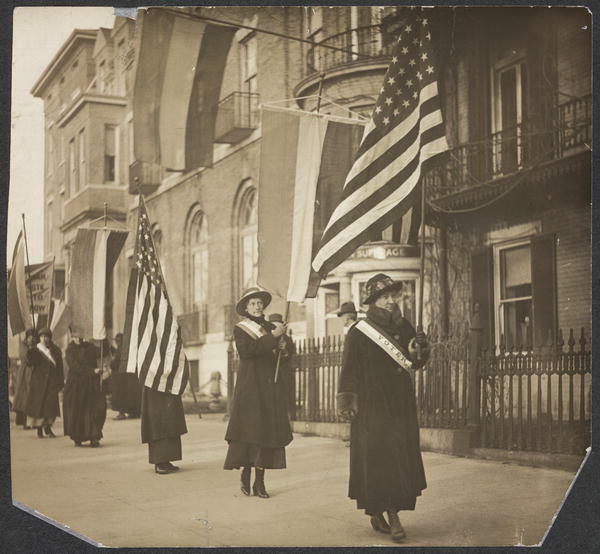 See our women’s history lesson plans and share the link with area teachers. This page took its inspiration from Washington state’s suffrage celebration page, and we owe them thanks! * Quoted in Lynn Sherr, Failure is Impossible: Susan B. Anthony in Her Own Words (Times Books, 1995), p. 196. Fine Job, Women. I made the film about California Women Winning the vote in 1911, and we Western women really showed the rest of the country how to work towards the rightness of a cause — grassroots, cooperatively, and with dedication. You gals were next in line. Isn’t it great to discover this history. You are really getting your state involved. Congratulations. I am happy to send you our film, if you replay to me at http://www.ishtarfilms.com. mention Montana and I will send at 50% off. So much credit is given to the Eastern states, when the Western women did the early footwork and set up tactics for the rest of the states. I am going to come visit. Thank you for keeping Women’s History alive and vital.